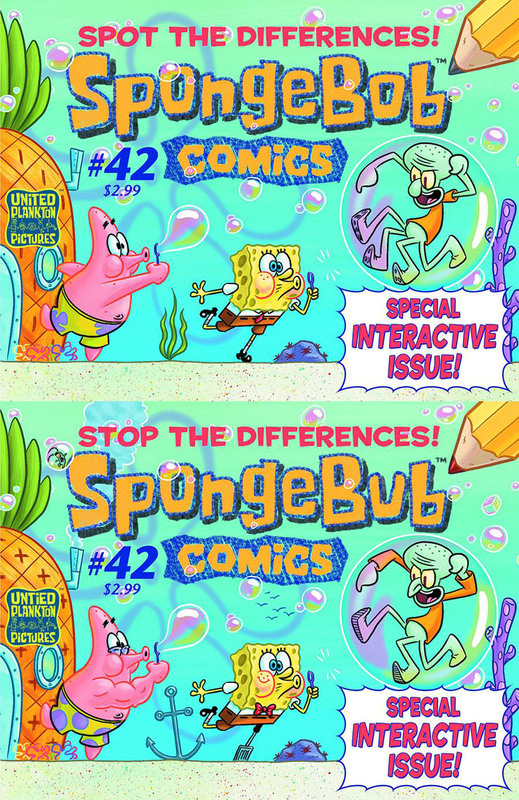 SpongeBuddy Mania - SpongeBob Comics #42: Spot the Differences! SpongeBob Comics #42: Spot the Differences! Squidward becomes obsessed with the Spot the Differences sections from his newspapers. SpongeBob loses the panels to a comic Patrick wrote and has to put them back in the right order. Mermaid Man and Barnacle Boy vs the Newfangled Superheroes! Mermaid Man and Barnacle Boy meet up with some old superhero friends. SpongeBob and Patrick make a neighborhood watch to see who's been making a mess behind Squidward's house at night. Man Ray gets a monitor that he can watch Mermaid Man and Barnacle Boy in their new Mermalair with. SpongeBob bakes a cake for Pearl's birthday but when it disappears he needs to do detective work to find out what happened to it. Random fact: All of the stories in this issue are interactive.